The platform, which is as high as a 50-floor building, is being used for the Sakhalin-1 project, where India’s ONGC has a 20 percent stake. The Sakhalin-1 project put the new Berkut (Golden Eagle in Russian) platform into operation on the Arkutun-Dagi oilfield. The press office of co-financier Rosneft—the largest oil company in the world—reported the superlative dimensions of the installation: 105 metres in length, 60 metres in width, and 144 metres in height, equal to a 50-floor building. Rosneft's press office also noted that the process of installing and transporting the platform broke several world records for the industry. Together with its foundation, the overall weight of the platform is greater than 200,000 tonnes, making it the largest platform of its type in the world. Berkut will soon receive its firefighting equipment and living quarters’ module. Drilling is set to commence in the autumn, after the completion of essential tests. The development of this oilfield will add up to 4.5 million tonnes of oil to the yearly yield of the Sakhalin-1 project. “The opening of this oil platform marks a significant event, as it is the largest platform in Russia and one of the most technologically advanced drilling platforms in the world,” says UFS IC macroeconomic analyst Vasily Ukharsky. “The Russian-made drilling rig installed inside has no rivals for power and working capacity.” He adds that the platform's structure provides for round-the-clock work in severe sub-Arctic conditions. 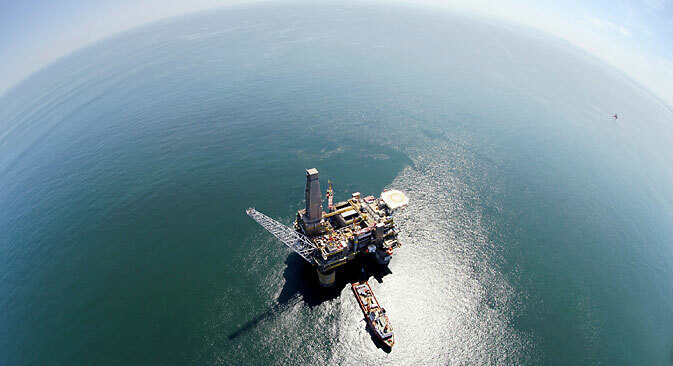 Particularly noteworthy is Berkut’s seismic protection system, whose ability to withstand a 9.0 earthquake without interruption of operations is unprecedented in the global oil industry. The platform likewise need not fear low temperatures, given that it can work at -44 degrees Celsius. Berkut is designed to withstand an 18-metre-high tsunami and the pressure of two metres of ice. President Vladimir Putin supervised the platform's opening, having earlier given the go-ahead to the Gazprom's Prirazlomnaya project for the first Russian oil platform on the Arctic shelf. Berkut is now the second large-scale installation on the shelf. “Thanks to projects like Berkut, we can now utilize richer—but difficult-to-access—oilfields, open up new production, and overall strengthen the socioeconomic development of our country's most important region: the Far East,” the Russian president stated via video conference. According to Dmitry Baranov, Finam Management’s leading expert, the platform's installation is clear evidence that Russia continues to expand its presence on the Arctic shelf. “The platform's construction and coming start of operations will increase the speed of the Far East's overall socioeconomic development, as it will see the development of considerable concomitant infrastructure,” Baranov adds. Sakhalin-1 is Russia's first large-scale project that works under a production sharing agreement. Project operator ExxonMobil had a 30 percent stake in the project, as does Japanese consortium SODECO. Rosneft and ONGC Videsh each have a 20 percent stake. The Sakhalin-1 project has already produced 64 million tonnes of oil, although output will gradually decrease. In 2014, yield may fall by 6 percent overall from 2013. However, exploitation of the Arkutun-Dagi field will help remedy the situation. Rosneft predicts that Sakhalin-1 will increase its annual output to 10 million tonnes by 2018.